Click here for the printable version of the rules. Read those rules first. This page has the full comprehensive rules. For an overview of the game, watch this video and take a look at the Pai Sho Resources page. Skud Pai Sho (simply called Pai Sho throughout these rules) is a Pai Sho variant based heavily on the various existing community rules, intended to be a comprehensive set of rules that make the game fun, competitive, and strategic. Learn more here. Skud Pai Sho is based on the Wiki Pai Sho tile set. 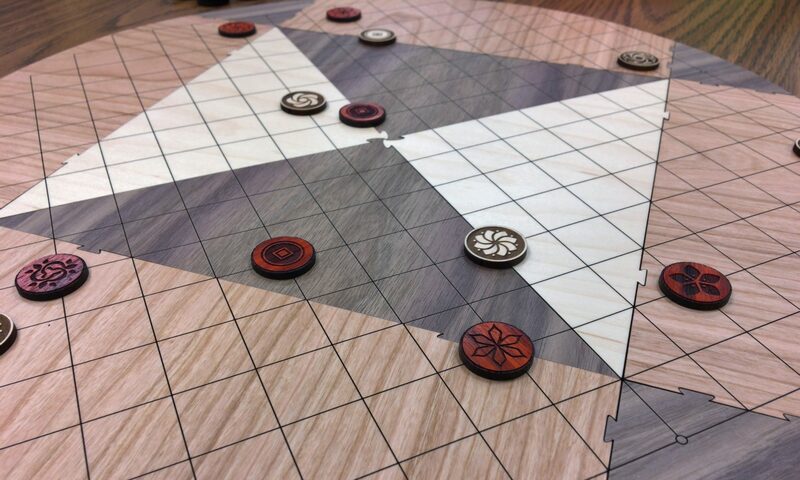 See Buying Pai Sho for reviews of available Pai Sho boards and tiles you can buy to play. You can also play online at skudpaisho.com. The object of Pai Sho is to arrange your tiles in a certain way (creating what are called Harmonies between tiles, which will be explained later) and prevent your opponent from achieving the same goal. Tiles are placed on the intersections of the lines as opposed to inside the squares. These intersections are referred to as points on the board. Each player has his or her own full set of tiles. Let’s look at what these tiles are and how many of each are in a set. There are two main types of tiles: Basic Flower Tiles and Special Tiles. We’ll talk about the details on how these tiles move and any special effects they have later. Basic tiles are split into Red Flower tiles and White Flower tiles. Special tiles are split into Accent tiles and Special Flower tiles. Note: The White Lotus tile does not count as a Basic White Flower Tile. It is a Special Flower Tile. Decide which player will be the Host and which player will be the Guest. The Host chooses 4 of his Accent Tiles to use during the game, and then the Guest chooses 4 of his Accent Tiles. The remaining Accent Tiles are set aside and not used during the game. Alternately, the Host may choose to allow only one of each Accent Tile to be given to each player if he wishes. Then, the Guest places a Basic Flower Tile in the Gate nearest to them. The Host places one of the same kind of tile in the opposite Gate (Gates are explained later). Then, the Guest has the first move. Note: For a quicker game, have the Host start with a Clashing tile instead of the same tile as the Guest. On your turn, you choose to either Arrange or Plant. If you choose to Arrange on your turn, move one of your Flower Tiles that is on the board and perform a Harmony Bonus action if applicable (tile movement and Harmony Bonus will be explained later). If you choose to Plant, place a Basic Flower Tile in an open Gate. Flower Tiles that are in a Gate are considered Growing. Flower Tiles that have been moved out of their Gate are considered Blooming. See the Basic Flower Properties section to see what tiles are Harmonious with each other and which tiles Clash with each other. If your opponent attempts to make a move that causes tiles to Clash, let him know that he cannot make that move. If at any point during a game both players notice that tiles have been illegally moved to form a Disharmony, remove the Clashing tiles from the board and return each of them to their owner’s hand of tiles. You only get one Harmony Bonus action per turn, regardless of how many Harmonies you create when moving a tile, or if additional Harmonies are created from the effects of playing an Accent Tile during a Harmony Bonus action. When a Basic Flower Tile lands on an opponent’s Basic Flower Tile that it Clashes with, the tile that is landed on is captured. Only Blooming Flower Tiles can be captured. Growing Flower Tiles cannot be captured. Capture abilities of Special Flower Tiles are explained in the Special Tile Properties section. When a tile is captured, remove it from the board. It is not used during the rest of the game. Each Flower Tile has its own movement and Harmony abilities. Tiles cannot move over other tiles, but may change direction any number of times as they move. Basic Flower Tiles can be referenced by shorter names, such as Red 3 or White 5, indicating their color and how far they can move. It’s also easy to remember which tiles are Harmonious or Clash with each other. The order of the tiles is a circle: Red 3, Red 4, Red 5, White 3, White 4, White 5. A tile may form Harmonies with the tiles next to it in the circle (for example, White 5 is Harmonious with White 4 and Red 3). A tile Clashes with its opposite tile (for example, Red 3 Clashes with White 3). Note: See the Skud Pai Sho Overview page for a visual of the circle of Harmony and an overview of all the tiles. Each Special Tile has unique affects on the game. See the Harmony Bonus section for information on when Special Tiles are played. Accent Tiles are Special Tiles that have a unique effect on the game. No tiles can form Harmony on the entire vertical or horizontal line that the Rock tile is on. Any Harmonies that would be formed anywhere on these lines are canceled and do not count. Does not affect Disharmony in the same way (but still disrupts Harmony or Disharmony like any other tile if between the two tiles). This effect lasts as long as the Rock tile is on the board. When played, a Wheel tile rotates all tiles on the points surrounding it (adjacent and diagonal), moving the tiles one space in a clockwise direction around the Wheel. A Wheel cannot be played on a point where it would move a Rock tile, cause any tiles to Clash, or if it would move a tile into an opposite-colored Garden, off of the board, off of a Gate, or onto a Gate. Any Blooming Flower Tiles on the points surrounding a Knotweed tile (adjacent and diagonal) are drained and are unable to form Harmony. Any Harmonies that would be formed by tiles on the surrounding points are canceled and do not count. Does not affect Disharmony in the same way. This effect lasts as long as the Knotweed tile is on the board. If played on a Flower Tile, move that Flower Tile to an empty surrounding point (adjacent or diagonal) and place the Boat tile in the original position of the Flower Tile. If played on an Accent Tile, both tiles are considered captured and removed from the board. A Boat cannot be played in a way that would cause tiles to Clash, and cannot move a Flower Tile into an opposite-colored Garden or onto a Gate. Basic Flower Tiles of either player form a Harmony with White Lotus tiles. The Harmony belongs to the player who owns the Basic Flower Tile. Cannot be captured (except by an Orchid that is able to capture Flower Tiles). Opponent’s Blooming Flower Tiles on points surrounding your Orchid (adjacent and diagonal) are trapped and cannot move. If you do not have a Blooming White Lotus tile on the board, your Orchid tile cannot be captured (except by an opponent’s Orchid that is able to capture Flower Tiles). Your Orchid tile can be captured by any of your opponent’s Flower Tiles. Your Orchid tile can capture any of your opponent’s Flower Tiles. The Pai Sho board is separated into separate areas called Gardens and Gates. The small red areas on the four sides of the board are the Gates. All other areas of the board are either a Neutral Garden, Red Garden, or White Garden. On certain points of the board, a tile may be in multiple areas of the board at once. A tile is in any area the tile touches on the board while it is on a point. Gates are the points within the red areas on each of the four sides of the board. There are four Gates. A Gate is open when there are no tiles on the Gate. Flower Tiles are played in an open Gate when they are Planted. You cannot move a tile that is already on the board onto a Gate. Accent Tiles cannot be placed on a Gate. The large red areas on the board are Red Gardens, white areas on the board are White Gardens, and the yellow (or non-colored) areas are Neutral Gardens. White Flower tiles are not allowed to end their move so that they are completely within a Red Garden. Red Flower tiles are not allowed to end their move so that they are completely within a White Garden. Any Flower tile may move into a Neutral Garden. Special Flower tiles may move into any Garden. The game ends if a Harmony Ring is formed, a player plays his or her last Basic Flower Tile, or if a player forfeits. The game ends when a player creates a Harmony Ring, which is a chain of Harmonies that goes around the center point of the board. The player who achieves the Harmony Ring is the winner. The game ends when a player plays his or her last Basic Flower Tile. When this happens, the player with more remaining Accent Tiles wins. If players have the same amount of Accent Tiles, then the player with the most Harmonies wins. The game can end when a player forfeits, but that just isn’t as fun. You can never win if you forfeit unless you agree to give your opponent a gift that he or she deems worthy enough for you to deserve the win.